Navratri, the nine-night festival, honors Goddess Durga, Goddess Lakshmi and Goddess Saraswathi in South India. It is known as Bommala Koluvu in Andhra Pradesh, Bathukamma in Telangana and Navarathri in Karnataka, Tamil Nadu and Kerala. Below is a brief idea on how to perform Navratri puja as per South India method. In 2018, the date of Navratri is from October 10 to October 18. Chaitra month rituals are observed from March 18 to March 25. Navratri is observed as Dussehra in Karnataka, where it is observed for ten days. The main event during Navratri in South India is the display of dolls and idols – Kolu and the placing of Kalash, which represents Goddess. Navratri puja might seem a huge complicated event for many. You can always perform a simple puja by worshipping the Goddess on nine days by lighting a lamp and offering a fruit as prasadam. Rituals are not important but devotion is important. Here is a step by step method on how to perform Navratri Puja. Get the house cleaned and ready. You are inviting Goddess into the home. Usually this is done on the Amavasya day, a day before the beginning of Navratri. Mango leaf festoons are installed on doors, windows and in puja room. Fresh Kolams are drawn. If you are keeping Kolu, get all the Kolu dolls ready. Repair broken pieces and use natural colors to paint them. Decide upon the Bommai Kolu Theme. Plan early about the pooja prasadam (naivedyam) and also about the gifts that you plan to give to women guests. If you are keeping Kolu dolls, purchase new dolls at least a couple of new ones. The most important doll needed is the Marapachi dolls (Male and Female pair of dolls). Face of Goddess to be stuck on Kalasha. Some people do not opt for this. Usual pooja items like lamp, incense, agarbattis etc. Lotus flower for Goddess Saraswati and Goddess Lakshmi. Jasmine for Durga. Avoid wild flowers. If you are giving gifts to women invited for Navratri Pooja, then the bag should contain betel leaves, betel nuts, a pair of round turmeric roots, a coconut, fruits, sweets, flowers, a small gift. You can also include cosmetics like eye kohl, kumkuma, bangles, comb etc. Navratri Puja begins on the Bhadrapada Amavasya day or Purattasi Amavasya day, a day before Navratri begins. All arrangements are done on this day. In some communities male members perform Tarpan or Shardham dedicated to dead ancestors in the morning. In the evening, Kalasha or Purna Kumbha is prepared. This is an invitation to Goddess to enter your home. Purna Kumbha or Kalash is kept on a kolam in such a place that there is space behind to keep the Bommai Kolu. You can attach a face of Goddess to the Purna Kumbha and decorate the Kumbha with jewelry, turmeric, sandal paste, flowers etc. Those who do not keep Kolu, keep the Kalash in the Pooja room. Betel leaves, Betel nuts, a coconut is placed in front of the Kalasha. Cooked rice or boiled and sweetened milk is kept as prasadam or naivedya in front of the Kalasha. This Kalasha is to be kept for next nine days – it symbolizes Goddess. A lamp is lit every evening and morning for nine days. 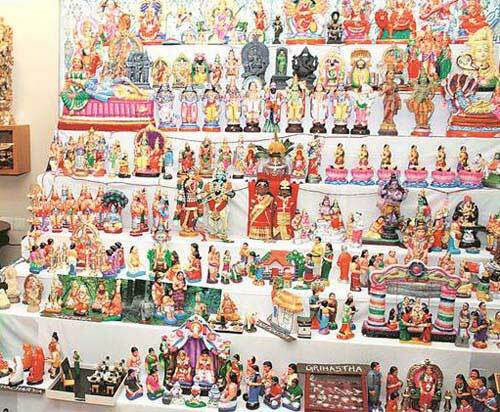 Next you can start arranging the Kolu dolls. Some people keep Lord Ganesha on the first step. Others opt for the Marapachi dolls. Women perform all the pujas during Navratri. You have already installed the Goddess in the form of Purna Kumbha. Light a lamp morning and evening on all nine days. Elaborate pujas are conducted in the evening. Other women are invited on any one of the evening. The first three days is dedicated to Goddess Durga. 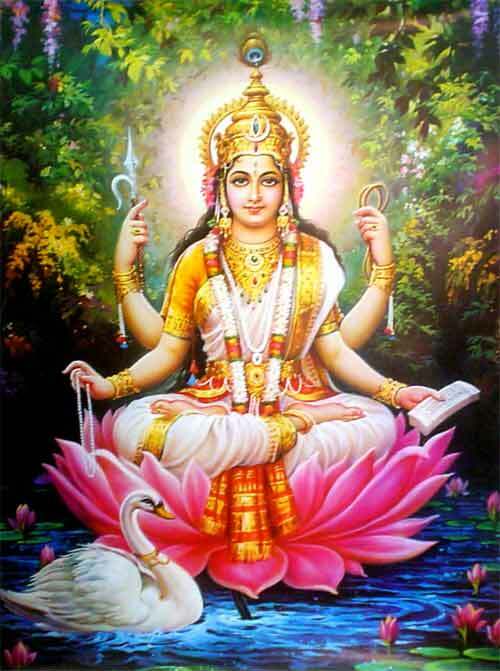 The next three days is dedicated to Goddess Lakshmi. The final three days is dedicated to Goddess Saraswathi. Fresh kolams are done on all nine days. Shlokas that are recited on nine days include Durga Ashtothram, Devi Mahatmyam, Shyamala Dandakam, Lakshmi Sahasranamam, Lakshmi Ashtothram, Lalitha Sahasranama, Saraswati Stotram, Saraswathi Ashtothram. Shlokas are recited while performing the puja. Sweets and naivedya prepared are shared with neighbors, relatives and friends. A kannika (young girl) is invited and she is given lunch and new clothes on the first day. Some people do the Kannika Pooja it on all nine days. The lamp is diffused after the puja daily. The puja concludes on the ninth day evening.